This condition is so named because it was first identified in adult breeding turkeys in Oregon State. It has since been seen in turkeys, in broiler parent chickens and also in large broiler chickens in various places. 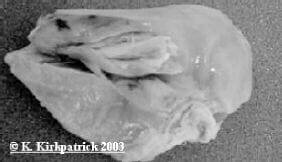 It does not usually cause any mortality or obvious clinical signs and so it is usually identified after slaughter. It is caused by a reduction in the blood supply to the deep pectoral muscles. Genetics may play a role in that it has been suggested that blood supply to the affected muscles is reduced in some heavy meat type birds. The condition can be reproduced by causing intense exercise of this muscle. Because it is enclosed in a relatively unyielding membrane, any swelling of the muscle tends to cut off the blood supply. Without adequate blood supply the tissue of the muscle begins to die, or suffer necrosis. Acute or chronic necrosis of the deep pectoral muscle on one or both sides. If recent, the muscle may be swollen and pale, with oedema within it and on its surface. If the condition is of over 7 days duration the muscle is dry and often shows greenish tinges. It may also start to be enclosed in a fibrous capsule. If of very long duration, it may become a healed scar. Lesions. It is very difficult to detect affected carcases in standard meat inspection. Transillumination of the breast may help identify affected carcases and may be worthwhile if the incidence is high. Avoidance of physical damage of this muscle, and, in particular excessive exercise. This will normally be due to excessive flapping in association with management activities (e.g. thinning operations in meat birds, artificial insemination in breeding turkeys, weighing birds etc). If inactivated vaccines are administered into the breast muscle it is preferable that they go into the superficial muscle which is better able to cope with swelling. Figure 26. A typical case of the chronic stages deep pectoral myopathy in a broiler chicken. The tissue in the centre is dry, greenish yellow, and flaking.